Traditional braces consist primarily of brackets, bands, spacers and wires, and they all play integral roles in properly aligning your teeth. But what happens when one of those components is broken? 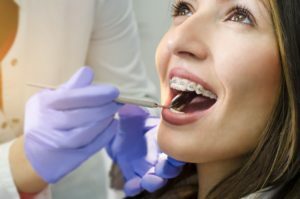 Depending on the situation, you may have an orthodontic emergency, and as you read on, your emergency orthodontist explains how you should respond so your appliances can be restored to a working condition. Spacers are rubber rings that are placed between your teeth and will usually be left there for a few days. Their function is to allow access to the area between your teeth so orthodontic bands can be added. However, they can sometimes slip out of position. If this happens, you should immediately reach out to your orthodontist to schedule a visit to have the problem corrected. Typically, this is considered a dental emergency because the spacers are vital to the function of your braces and the maintenance of your results. Furthermore, there are no suitable ways to temporarily fix the problem; the only remedy is to seek the help of your orthodontist. If this happens, you should treat it as a dental emergency because a cut or broken wire can be swallowed or inhaled, which could lead to serious health problems. Therefore, you should contact your emergency dentist to schedule a visit to be examined. In the interim, you can place a small amount of orthodontic wax over the end of the wire and reinsert it. If the wire has caused a sore, rinse your mouth with warm, salt water or an antiseptic solution for relief. Another mishap that can occur when wearing braces is for the bands (metal rings) that are cemented around the back teeth to partially dislodge. In cases where the band completely falls out, you shouldn’t try to reinsert it. Instead, bring it to your emergency dentist’s office when you visit. The brackets are metal or ceramic pieces that your orthodontist will affix to your teeth using a composite resin material. There are certain behaviors that can contribute to damaging or dislodging your brackets, though, such as eating hard or sticky foods. Again, you should contact your emergency dentist for care, but meanwhile, you can place orthodontic wax at the end of the brackets to protect your tongue, gums and cheek from irritation. One of the primary ways of enjoying a productive treatment process with braces is to follow the instructions provided by your orthodontist so you can avoid any emergency situations. However, unexpected things can happen, but with the information you now have, you don’t have to worry about an orthodontic emergency ruining your holiday cheer! Dr. James A. Hart earned his dental degree from Baylor College of Dentistry and later received his certificate in orthodontics and a Master of Science from the University of Chicago Pritzker School of Medicine. He has since gone on to provide the best in orthodontic care for the past 40 years. An affiliate member of the American Association of Orthodontics, Southwestern Society of Orthodontics and other professional organizations, Dr. Hart helps patients recover from dental emergencies at Hart Orthodontics, and he can be reached for more information through his website.